1 A Proposal to the Health and Care Professions Council for the inclusion of Cognitive Behavioural Therapy education within the current curriculum to enhance the skills of Physiotherapy students. 2.3 How and Why Does CBT Fit Into Physiotherapy Practice? 2.3.4 Does CBT Work For All Patient Populations? A Proposal to the Health and Care Professions Council for the inclusion of Cognitive Behavioural Therapy education within the current curriculum to enhance the skills of Physiotherapy students. The aim of this wiki page is to present to the Health and Care Professions Council (HCPC) the importance of including Cognitive Behavioural Therapy (CBT) training into physiotherapy education. This will be illustrated through the synthesis of the current evidence base, the provision of case studies and the construction of a sample module. Critically appraise the importance of CBT in physiotherapy practice for the benefit of current physiotherapy students. Justify and synthesise evidence for the inclusion of CBT education for physiotherapy students to the HCPC. Formulate an appropriate CBT module that enhances the ability of physiotherapy students to address the psychosocial aspects with regards to patients in various settings. Demonstrate the construction of an accessible social media resource that enhances the delivery of the CBT module material. In the early 1960s, psychoanalyst professor Aaron Beck developed cognitive therapy after investigating the psychoanalytic concepts of depression. During his studies, he discovered that depressed patients spontaneously experienced automatic negative thoughts. These negative thoughts fell into three categories: negative thoughts about themselves, the world, and the future. After spending some time with these patients, Beck recognised that these automatic negative thoughts were highly related to the individual’s emotions. Beck started to notice rapid improvements amongst these individuals after helping them identify, evaluate and respond to their maladaptive thinking and behavioural patterns. In order to see the effects of this form of cognitive therapy, a randomised controlled study was conducted looking at the impact of cognitive therapy in depressed patients. Results showed cognitive therapy to be as effective as imipramine, an antidepressant. These findings were a huge milestone as a form of talk therapy had been compared to a pharmacological medication. Today CBT has been scientifically proven to be effective in numerous clinical trials for varying disorders. CBT stems from the cognitive model of psychopathology. This theory looks at how individuals' perceptions and thoughts about situations influence their emotional, behavioural and physiological reactions. For example, when individuals are stressed, their thoughts tend to be distorted and dysfunctional. If individuals learn to identify, address and correct these thoughts, their stress levels tend to decrease leading to more functional behaviour. CBT teaches individuals to confront their irrational thoughts, in a more realistic and adaptive manner so that they experience improvements in their emotional state and behaviour. CBT can include a number of cognitive and behavioural techniques including self-instructions and adaptive coping strategies. CBT involves six overlapping phases that can be adapted to a diverse set of populations with various disorders. 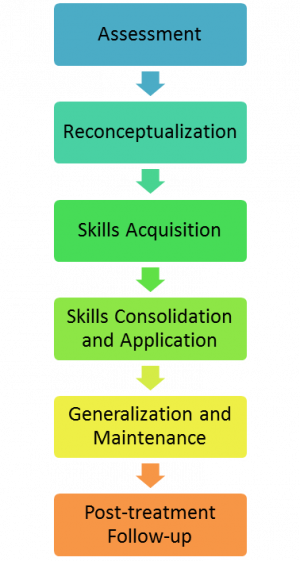 The phases represent the different theoretical components of the multidimensional treatment. Even though CBT follows a logical sequence, the treatment should be flexible and individualised to the patient’s needs. This phase involves assessing information given from the patient and family through a series of self-reported measures and observational procedures to identify the degree of psychosocial impairment. Information provided determines the most appropriate course of action. Patients are often asked to maintain a self-report diary. Seeks to help patients challenge and question their maladaptive thoughts (e.g. “I am a failure in life because I am in pain”). Collaboratively set goals with the patient. Therapist uses various cognitive and behavioural strategies to teach patients how to deal with obstacles in their day to day lives. Collaboratively focus on problem solving strategies i.e. relaxation techniques/pacing/graded exposure/coping strategies. Patients are given homework to help reinforce the skills that they have learned. Patients review homework and practice skills that have been taught and considers potential problematic situations that may arise. Patients evaluate their progress and attribute success to their own coping efforts. All aspects of therapy are reviewed. Therapist monitors and evaluates patient's application of CBT to their life. How and Why Does CBT Fit Into Physiotherapy Practice? Current physiotherapy education stems from the International Classification of Function, Disability and Health (ICF) Model. The incorporation of CBT into physiotherapy practice will enhance the delivery of the bio-psychosocial model providing a more holistic approach towards patient-centred care. This will ensure a more comprehensive and successful journey for both patient and practitioner. The correct implementation of CBT by physiotherapists within their scope of practice will increase the success of treatment and overall outcome for patients. The fundamental principles of both CBT and physiotherapy are comparable and integrate cohesively as shown in Table 1. The addition of CBT in a physiotherapist's skill set can help enable patients to identifiy and change negative thought patterns which are detrimental for successful rehabilitation. This allows patients to regain internal locus of control which can positively influence the patient’s specific problems. Physiotherapists are in a prime position to help manage and modify a patient's maladaptive thoughts. The start of a physiotherapy assessment begins with a subjective examination. This provides the opportunity for physiotherapists to gauge if CBT would be an appropriate tool for the patient. Appropriate tools to identify psychosocial risk factors i.e. yellow flags, would enable the collaboration of the physiotherapist and patient to target these patient problems when setting SMART goals. A treatment plan can then be seamlessly adapted with both the physical and psychosocial conditions in mind. This may also help to reduce the impact of any negative stigma patients may have with regards to requesting and obtaining psychological support. In some cases, physiotherapists will be the first point of health care contact for many patients. This places physiotherapists in a prime position to help treat the patient holistically. In scenarios containing complex patients with psychosocial issues at the stem of the problem list, the aim of treatment can be directed appropriately with collaboration between the physiotherapist and patient. This is likely to reduce rates of relapse due to previous maladaptive behaviours and reduce re-admission rates. The amalgamation of CBT into the current physiotherapy curriculum would equip physiotherapy students with the skills to identify and manage patients indicative of yellow flags early, thus reducing the need for a referral to a clinical psychologist. Ultimately, physiotherapists tackling subtle psychosocial issues at the start may decrease contact time amongst the multidisciplinary team and decrease health costs. This would have the potential to increase the success rate of treatment and reduce readmissions as the patient would learn to self manage their behaviours. In addition to the principles of physiotherapy and CBT integrating seamlessly, there exists some gaps in current physiotherapy training. Additionally, the focus of continuing professional development (CPD) continues to enforce the biomedical model of assessment and treatment, with minimal CPD workshops that address the psychosocial approach. A CBT module within the physiotherapy curriculum can help further develop a physiotherapy student to become a more well-rounded and competent clinician. There is empirical evidence that suggests CBT is effective in improving conditions such as anxiety, depression, post-traumatic stress disorder, eating disorders and chronic pain. In the United Kingdom, the National Institute for Health and Clinical Excellence (NICE) recommends CBT as the treatment of choice for a number of mental health illnesses previously mentioned. In addition there is a growing body of evidence behind the effectiveness of CBT for physiotherapy, producing significant improvements for patients with back pain, chronic pain and fibromyalgia with regards to function, pain experience and coping strategies. There has been an increase in the demand for interventions that may prevent the development of persistent pain problems. In 1997, a review of 10 trials of early interventions for acute back pain based in primary care settings was carried out. These programmes dealt with fear and anxiety which is often associated with acute pain, leading to positive results over various control conditions. A study conducted in 1998 also found that a cognitive-behavioural programme for patients with acute back pain significantly reduced worry and disability at follow-up – therefore preventative measures may be viable. In 2001, a randomised controlled trial was published which aimed to investigate the preventative effects of a CBT group intervention for people reporting neck or back pain. The participants had experienced four or more episodes of relatively intense spinal pain during the past year but had not been out of work for more than 30 days. As a result the aim was to prevent a non-patient population developing a more serious pain problem and entering a chronic stage. The experimental group participated in a six-session structured programme where the individuals met in groups of 6-10 once a week for two hours. The CBT group showed more stable improvements over the control group with reduced sick days. The CBT group also reported a decrease in fear avoidance and an increase in the number of pain-free days concluding early preventative measures may be helpful. With regard to the issue of absenteeism, musculoskeletal disorders (MSDs) are one of the most commonly reported work-related illnesses. There is now general agreement among the various occupational health guidelines for management of MSDs. This encompasses the identification of psychosocial obstacles to recovery, provision of advice that MSDs are self-limiting conditions and that remaining at work or an early return to work (RTW) should be encouraged and supported. A study was conducted in 2006 in a large pharmaceutical company in the UK. Occupational health nurses (OHN) were trained to deliver an intervention to workers taking absence due to various MSDs including low back pain (LBP) and upper limb disorders. This training package included education about pain and pain mechanisms, tackling negative beliefs and attitudes and reinforcing the importance of keeping active and early RTW . Results showed a decrease in absent days in one particular site compared to the control site where workers were seen by the OHN on RTW. In summary, this study adds to emerging evidence that absence from work can also be reduced by providing information and support to employees. CBT has also been used successfully with angina patients. The Heart Manual is a six-week cognitive behavioural rehabilitation tool designed to correct misconceptions about the cause of Myocardial Infarction (MI). In addition it helps patients develop strategies for dealing with stress in order to neutralise enduring misunderstandings. The Heart Manual is one way of providing educational and psychological support for post MI patients, although it will not meet the needs of a minority who require additional help. An initial randomised controlled trial evaluating the Heart Manual found that those receiving the manual had improved emotional states, fewer GP contacts and hospital readmissions at six months post MI. Subsequent studies have found significantly fewer readmissions in the 77 treated patients and improvement in emotional state and sense of control at six months. As previously mentioned, CBT can also play a role in the treatment of various mental health conditions. A study was published in 2002 which aimed to test the effectiveness of added CBT in accelerating remission from acute psychotic symptoms in early schizophrenia. A 5-week CBT programme plus routine care was compared with supportive counselling plus routine care and routine care alone in a multi-centre trial randomising 315 people with DSM-IV schizophrenia and related disorders in their first (83%) or second acute admission. Linear regression over 70 days showed predicted trends towards faster improvement in the CBT group. Concluding that CBT shows transient advantages over routine care alone or supportive counselling in speeding remission from acute symptoms in early Schizophrenia. Does CBT Work For All Patient Populations? As mentioned previously, CBT is applicable in a wide range of situations and beyond the initial problem for which the patient may seek treatment. Although it has been specialised and adapted for use within a number of specific disorders ranging from depression to psychosis, CBT has also become increasingly popular for a wide variety of chronic pain conditions, particularly for chronic LBP. Despite this, there exists a patient population that is less likely to respond to CBT as a treatment. In addition, some research has shown that a CBT approach is equally as effective at reducing pain levels as traditional interventions. Perhaps a more systematic approach to matching CBT to certain patient populations and filtering it to those who are more likely to respond positively to treatment is the approach required for CBT. 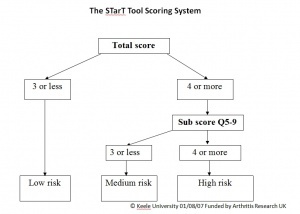 The Keele STarT Back Screening Tool (SBST) is designed to address the mismatch. A sample musculoskeletal (MSK) screening tool can be downloaded here. 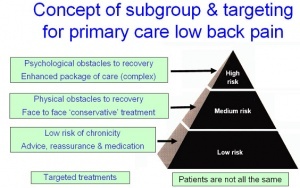 The SBST categorises patients with LBP into three subgroups based on their prognosis (low risk of chronicity, medium risk with physical obstacles to recovery, and high risk with psychological obstacles to recovery). The practice of physiotherapy revolves around patient centered care. The choice for a physiotherapist to utilise CBT as an intervention stems from prior CBT training and therapist intuition/clinical reasoning. Moreover, a tool such as the SBST can determine if any discrepencies exist between patients. The SBST is valid and repeatable, and consists of 9 items which include: referred pain, co-morbid pain, disability, bothersomeness, catastrophising, fear avoidance, anxiety and depression. The latter 5 items combine to form a subscore relating to psychosocial factors that indicates appropriateness for CBT as an intervention. The SBST is currently being adapted to MSK conditions, with trials occurring in NHS 24 in Scotland. Targeting patient subgroups that are most likely to be receptive to CBT can help improve outcomes and reduce costs. A trial of the SBST conducted by Hill et al. 2011 demonstrated increased health benefits along with reduced cost of health care. The trial revealed that with the SBST and trained therapists to deliver targeted interventions for each of the three subgroups of patients, there was a direct mean savings of £34.39 per patient and an indirect productivity saving of £675 per patient when compared with patients receiving current care. Pain-related productivity and societal losses can manifest through sick days and repeat health care visits. A randomised control trial conducted in 2005 found that CBT in addition to physiotherapy reduced the mean number of health care visits due to pain from 6 to 1, and reduced the percentage of sick days from 9-14% to 2-5% when comparing groups that received minimal treatment and CBT. This type of evidence suggests that with therapeutic interventions that take into account the biopsychosocial model of patient care, there is a possibility to reduce disability and reduce the cost of care. The evidence suggests the effectiveness of CBT is improved when directed at the correct patient populations. Tools like the SBST need to be used in conjunction with sound clinical reasoning in a patient centered approach to target those who are likely to benefit from it. With adapted versions of the SBST to encompass other MSK conditions being trialed with NHS 24 currently, newly trained physiotherapists would benefit from CBT training to effectively utilise this new information gained from patients in practice. Physiotherapists are evidenced-based practitioners and there exists not only a need for further training to incorporate CBT principles, but a desire from practicing physiotherapists to expand knowledge on CBT principles. Reassurance to family members of those affected by chronic and acute conditions is essential in the treatment and recovery of the patient. Programmes designed to include families in the care of relatives with chronic conditions can be implemented, particularly in the terminal setting. These programmes can guide family members with goal setting, supportive communication techniques and provide them with the tools to assist in monitoring clinical symptoms and medications. For those with career threatening injuries (e.g. professional athletes or manual workers), coping with potential loss of income can be extremely stressful for both themselves and their families. In order to get families to adopt a supportive role there often needs to be a change in cognition. Unrealistic and irrational thoughts regarding their loved ones prognosis may be detrimental to the treatment process. Therefore, where possible, such beliefs should be addressed to reduce the potential of any maladaptive behaviours. For those with acute conditions that may result in loss of earnings or concept of self, CBT may help to prevent anxiety and cognitive distortion (e.g. catastrophising), as well as increased adherence to the rehabilitation protocol. When those working in palliative care settings have been interviewed with regards to work place stressors, more stressors were related to difficulty with colleagues, work environment, and occupational roles than with the interaction with patients and their families. Seeking support from colleagues is often preferred and more accessible then official support models in place for those working in health provision areas with high stress. With an insight into the cognitive and behavioural components of our own actions we can develop higher self-monitoring traits along with increased empathy. This in turn may lead to further understanding of fellow professionals within the MDT thus enabling us to defuse any potentially volatile situations. Furthermore, many of the environments in which physiotherapy skills are required tend to be highly stressful and emotional. As a result we may be required to engage in supportive behaviour and cognitive reasoning with colleagues. The Health and Safety Executive recognises that there are many factors in the workplace that contribute to strains on NHS professional’s mental health. These include: excessive demands, lack of control, lack of support, poor working relationships, role ambiguity and organisational change. The 2009 Boorman Review reported that the NHS loses 10 million working days annually due to sickness costing the NHS an estimated £555million, with mental health along with MSDs being the primary cause. Combined they are the leading cause of health-related early retirement in the NHS. The Work Foundation estimates that presenteeism due to poor mental health leads to a loss of working time nearly 1.5 times that caused by sickness absence due to mental health in the United Kingdom. By having an understanding of ones own cognitive state, AHPs may be able to overcome the inherent stressors in their jobs. It has been documented that self-directed CBT can reduce an individual’s own stress, anxiety, depression and cognitive dissonance. As CBT incorporates the introspection of thought process from Cognitive Therapy and the goal of behavioural change from Behavioural Therapy, CBT can be a useful tool for physiotherapists in their own development as a competent and holistic professional. Enhanced insight into maladaptive thoughts may lead to a reduction in mental health issues, likely resulting in a decrease in work days lost in the NHS. It is essential that the patient views therapy as teamwork. It is important for the therapist to provide empathy, warmth and genuine regard through listening and understanding the patients' true feelings. Ensure the patient understands and agrees with modes of therapy utilised. 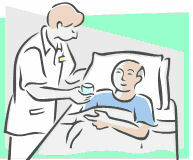 Encourage the patient to take an active role in their recovery by providing therapy homework. Elicit SMART goals from the start to ensure the patient understands what they are working towards. The therapist should aim to teach the patient skills and techniques of how to be their own therapist. Patients are usually treated for 6-14 sessions during which the therapist aims to provide relief, resolve patients' most pressing problems and teach them skills to avoid relapse. In order to maximise efficiency and effectiveness each session should be structured. CBT uses various techniques in order to cater to the individuals' needs. Patients can have hundreds of automatic thoughts everyday but it is important that the therapist teaches the patient to identify the key cognitions and how to respond. however over the last 18 months the pain has become constant and he is finding it much harder to work. The main problems at work are bending down, working in cramped places (e.g. under sinks), carrying tools and driving for longer than half an hour. His only partial relief is a long, hot bath at the end of the day which does not help the pain, rather helps him relax. 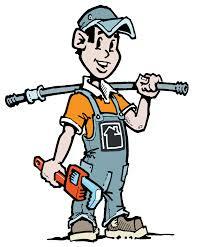 He is self-employed and has a family to support so tends to “push on” to get the work done. Towards the end of the day he says he’s “good for nothing except lying on the sofa” along with spending the weekend resting and recuperating for the upcoming week. His GP has ruled out the need for further investigations but has prescribed various painkillers which proved to be ineffective. A year ago he attended physiotherapy where he was given exercises and received manual manipulation, neither of which helped. He found the exercises very painful and therefore avoided them as he deemed them detrimental. All active movements of the lumbar spine reduced to ¾ of normal range. Neurological examination is normal. Palpation of the lumbar spine reveals pain and tenderness at all levels. SLR was 70 degrees bilaterally. Education regarding the boom/bust model. 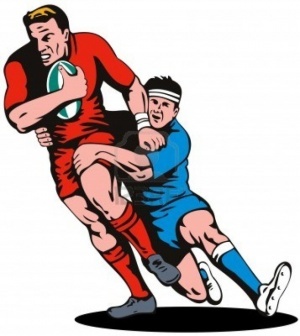 A 26-year-old professional rugby player has reported coming off his first right ACL-repair. 8 months prior he had a traumatic injury in a game when a player tackled his right knee into valgus. He heard a “pop” and had pain with immediate swelling and went to A&E. An MRI revealed a triad injury of the right knee (ACL rupture, MCL tear, medial meniscal tear). He had an arthroscopy 4 days following the incident. Since then, he reports he has received daily physiotherapy but has not returned to rugby since. He is experiencing ongoing weakness in his right knee, feels very fearful of re-injury and returning to the full contact nature of the sport. Graded exposure to progressively increase the amount of full sprints and cutting movements. Gradually increasing minutes played in real game. Thought re-evaluation/re-modelling of maladaptive thoughts and fear avoidance behaviors. A 45-year-old woman with end stage lung cancer lives at home with her husband and 12-year-old daughter. The patient has been managing personal ADLs until recently and is struggling with fatigue and nausea resulting in declining motivation. She has been diagnosed with depression but does not wish to take medication for this as she feels she ‘is already taking enough pills’. She has started to decline physiotherapy sessions because she ‘doesn’t see the point’. As a result of her low motivation and compliance, her exercise tolerance is declining. Her husband feels he is unable cope with the role of primary caregiver and the inevitability of single parenthood through bereavement. Upon seeing the impending loss of a close family unit, the MDT are beginning to struggle with maintaining their professional composure. Thought remodelling to aid the patients acceptance of the situation along with an understanding of the value of maximizing remaining quality of life for her and her family. Realising the stage of grief that the husband may be presently at and allowing time for acceptance of the situation for him to adopt his new role. Provide support to colleagues and self through open lines of communication and introspection to highlight irrational thoughts regarding loss. 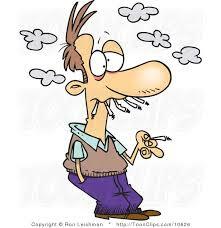 h up secretions, has been taught the Active Cycle of Breathing but does not feel confident that it works therefore doesn’t comply with the prescribed technique. Remodeling of beliefs towards ACBT and smoking. Exploration of strategies/problem solving with quitting smoking. Education regarding smoking. Thought monitoring to examine the grounds on which he bases his reluctance to exercise. Why current students and newly qualified physiotherapists need CBT training? A growing body of evidence has highlighted the important roles cognitive factors can have on an individual’s health contributing to disability and influencing treatment response. Research has shown that a good treatment outcome is more positive in people who strongly believe in their internal control over illness. Thus by gaining a greater understanding of identifying and evaluating these maladaptive patterns in patients, they can then apply CBT which will aid in their overall success. The overall aim of this workshop is to prepare physiotherapists with an overview of CBT and provide them with the tools and knowledge for the application of this approach. Students will complete approximately 10 hours of CBT training through a combination of self-directed online tutorials and a practical element. 8 online YouTube videos: Self-directed. 4 practical classes (1 hour each): individual’s will take part in four 1-hour practical classes where they will gain insight on CBT principles, role play various scenarios and implement several strategies. The module is spread over an 8-week period. To become familiar with the theory of CBT. To build upon the individual’s existing knowledge of CBT. To provide the opportunity for practice of various CBT strategies. To enhance individual confidence when using CBT in clinical practice. Training will take place between the students 2nd and 3rd placement in order to better prepare the students for their final placements. Having previously been on placement, students will have a better understanding and appreciation of how and when CBT can be applied and to whom it may benefit. Completion of CBT training will be a requirement on the students' passport in order to graduate successfully. Completion of CBT training will contribute to the students' CPD portfolio. The online component of the CBT module for physiotherapy students will be available via the video hosting website: YouTube. YouTube is a free to use, internationally available format that allows videos to be searched for, saved, discussed and easily linked to others. YouTube is accessible on an array of platforms such as laptops, tablets and smartphones, which is vital in the ever-changing landscape of personal computing. YouTube commands one of the biggest audiences in terms of internet traffic in the world with an estimated 100 million unique viewers each month. 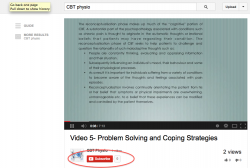 As a result of YouTube’s search and subscription feature it will be easy for students to find the “CBT Physio” videos and subscribe to the channel to remain up to date. In order to access the YouTube channel more effectively there is the capacity for individual users to receive email notifications of new videos along with a Twitter account. Twitter is the second most accessed social media site (behind Facebook) with over 6 million external sites linking to it. This online self-directed study, presented by CBT Physio, explores the application of CBT principles into physiotherapy practice. Step 1: By going to www.youtube.com the user will be able to freely access the video sharing website. 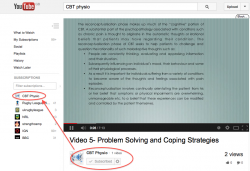 Step 2: Entering "CBT physio" will initiate a search of all relevent videos. Step 3: The top result is our sample clip. Step 4: The user can easily subscribe to the channel to recieve updates and subsequently be notified when new videos are published. Step 5: The channel will then be added to the user's list of subcriptions. 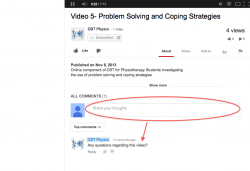 Step 6: Below the video is a comment section for both the user and publisher to discuss the video content. Step 7: From the channels home page the user can access the corresponding Twitter account. Step 8: The Twitter account can be followed with a click of a button ensuring the user is updated and informed of any activity. Step 9: Any updates from the Module are then fed directly to the user's Twitter timeline with direct links to the video. This physio-pedia page aims to engage with the HCPC board members regarding the importance of including CBT within the current physiotherapy curriculum. The evidence demonstrates that CBT can benefit all aspects of the patient journey which incorporates not only the patient, but family members and the MDT as well. Current physiotherapy education attempts to emphasize and root its practice based on the ICF model. The integration of a CBT module in the current curriculum would highlight the importance of combining both the biomedical and psychosocial models of healthcare. Numerous benefits of CBT have been demonstrated throughout this proposal. These include enhancing the patient journey, facilitating a more efficient practice and ultimately minimising health care costs. The sample module this page presents demonstrates the simplicity and feasibility of implementing a CBT module. ↑ 1.0 1.1 Beck J. Cognitive Therapy: Basics and Beyond, 2nd ed. New York: Guildford Press, 2011. ↑ 2.0 2.1 Donaghy M, Nicol M, Davidson K, editors. Cognitive-behavioral interventions in physiotherapy and occupational therapy. Edinburgh: Elsevier, 2008. ↑ Gatchel RJ, Rollings KH. Evidence informed management of chronic low back pain with cognitive behavioural therapy. The Spine Journal 2008; 8(1):40–44. ↑ Turk D, Flor H. A cognitive-behavioral approach to pain management. In: Mcmahon S, Koltzenburg M, editors. Wall and Melzacks textbook of pain. London: Elsevier Churchill Livingstone, 1999. p1431-1441. ↑ Wright J, Basco M, Thase M. Learning cognitive-behaviour therapy: An illustrated guide. London: American psychiatric publishing inc, 2006. ↑ Foster N, Delitto A. Embedding psychosocial perspectives within clinical management of low back pain: Integration of psychosocially informed management principles into physical therapist practice – challenges and opportunities. Journal of American Physical Therapy Association 2011;91:790-803. ↑ Van Tulder MW, Ostelo R, Vlaeyen JWS, Linton SJ, Moreley SJ, Assendelft WJJ. Behavioral treatment for chronic low back pain: A systematic review within the framework of the Cochrane back review group. Spine 2000:25(20);2688-99. ↑ Morley S, Eccleston C, Williams A. Systematic review and meta-analysis of randomized controlled trials of cognitive behavior therapy and behavior therapy for chronic pain in adults, excluding headache. Pain 1999:80;1-13. ↑ Rossy LA, Buckelew SP, Dorr N, Hagglund KJ, Thayer JF, Mcintosh MJ, Hewett JE, Johnson JC. A meta-analysis of fibromyalgia treatment interventions. Annals of Behavioral Medicine 1999:21(2);180-91. ↑ Von Korff M, Moore JE, Lorig K, Cherkin DC, Saunders K, González VM, Laurent D, Rutter C, Comite, F. A randomized trial of a lay-led self-management group intervention for back pain patients in primary care. Spine 1998; 23(23): 2608–2615. ↑ Waddell G, Feder G, Lewis M. Systematic reviews of bed rest and advice to stay active for acute low back pain. British Journal of General Practice 1997; 47(423):647–652. ↑ Linton SJ, Ryberg M. A cognitive-behavioural group intervention as prevention for persistent neck and back pain in a non-patient population: a randomized controlled trial. Pain 2001;90(1-2):83–90. ↑ McCluskey S, Burton AK, Main CJ. The implementation of occupational health guidelines principles for reducing sickness absence due to musculoskeletal disorders. Occupational Medicine 2006;56:237–242. ↑ Lewin B, Cay EL, Todd I, Sorgal I, Gordfield, Bloomfield P. The Angina Management Programme: a rehabilitation treatment. British Journal of Cardiology 1995; 2: 221-226. ↑ Lewin B, Robertson IH, Cay EL, Irving JB, Campbell M. Effects of self-help post myocardial-infarction rehabilitation on psychological adjustment and use of health services. Lancet 1992; 339(8800): 1036-1040. ↑ O.Rourke A, Hampson SE. Psychosocial outcomes after an MI: evaluation of two approaches to rehabilitation. Psychology Health and Medicine 1999; 4(4): 393-402. ↑ Vlaeyen JWS, Morley S. Cognitive-behavior treatments for chronic pain: What works for whom?. Clin J Pain 2005;21:1-8. ↑ Eccleston C, Williams ACDC, Morley S. Psychological therapies for the management of chronic pain (excluding headache) in adults (review). Cochrane Database of Systematic Reviews 2009:2;1-102. ↑ Keele University. STarT Back Screening Tool Website. http://www.keele.ac.uk/sbst/usingscoringthesbst/ (accessed 28 October 2013). ↑ Hill JC, Dunn KM, Lewis M, Mullis R, Main CJ, Foster NE, Hay EM. A primary care back pain screening tool: Identifying patient subgroups for initial treatment. American College Rheumatology 2008: 59(5);632-41. ↑ Hill JC, Whitehurst DGT, Bryan S, Dunn KM, Foster NE, Konstantinou K, Main CJ, Mason E, Somerville S, Sowden G, Vohora K, Hay EM. Comparison of stratified primary care management for low back pain with current best practice (STarT Back): a randomized controlled trial. Lancet 2011:378;1560-71. ↑ Linton SJ, Boersma K, Jansson M, Svard L, Botvalde M. The effects of cognitive-behavioral and physical therapy preventive interventions on pain-related sick leave: A randomized controlled trial. Clin J Pain 2005:21;109-19. ↑ Beissner K, Keefe FJ, Main CJ. Discussion: Cognitive behavioral therapy for patients with chronic pain [PODCAST]. Physical Therapy (PTJ): Journal of the American Physical Therapy Association. http://podbay.fm/show/272092273/e/1243538700. (accessed 4 Nov 2013). ↑ Jamison R, Virts, K. The influence of family support on chronic pain. Behaviour Research and Therapy 1990; 28(4):283-287. ↑ Rosland A, Piette J. Emerging models for mobilizing family support for chronic disease management: a structured review. Chronic Illness 2010; 6(1):7-21. ↑ Bascom P, Tolle S. Care of the family when the patient is dying. Western journal of medicine 1995; 163(3):292. ↑ Vachon M. Team stress in palliative/hospice care. Hospice Journal 1987; 3(2-3):75-103. ↑ Fernandes C, Bouthillette F, Raboud J, Bullock L, Moore C, Christenson J, Grafstein E. Violence in the emergency department: a survey of health care workers. Canadian Medical Association Journal 1999; 161(10):1245-1248. ↑ Boudreau R, Moulton K, Cunningham J. Self-directed cognitive behaviour therapy for adult with diagnosis of depression: systematic review of clinical effectiveness, cost-effectiveness and guidelines. Canadian Agency for Drugs and Technologies in Health 2010. ↑ Proudfoot J, Everitt B, Shapiro D, Goldberg D, Mann A, Tylee A, Gray J. Clinical efficacy of computerised cognitive–behavioural therapy for anxiety and depression in primary care: randomised controlled trial. The British Journal of Psychiatry 2004; 185(1):46-54. ↑ Clouder L. Reflective practice in physiotherapy education: a critical conversation. Studies in Higher Education 2000; 25(2):211-223. ↑ Butler DS, Moseley GL. Explain Pain. 2nd ed. Noigroup Publications, 2013. ↑ Maciejewski PK, Zhang B, Block SD, Prigerson HG. An Empirical Examination of the Stage Theory of Grief. The Journal of the American Medical Association 2007:297(7);716-23. ↑ Boothby J, Thorn B, Stroud M, Jenson M. Coping with pain. In: GATCHEL, R., Turk, D. (eds.) Psychological factors in pain. 1999. New York: Guilford Press, pp. 320-345. ↑ Wells P, Frampton V, Bowsher D, editors. Pain managment by physiotherapy. Oxford: Butterworth-Heinemann, 1988. ↑ Gill P, Arlitt M, Mahanti A. YouTube traffic characterization: a view from the edge. In Proceedings of the 7th ACM SIGCOMM conference on Internet measurement 2007: 15-28.